Austin’s Tejano (Mexican-American) population expanded substantially in the early 1900s, and racial segregation concentrated the growth in East Austin. Sustaining the community’s cultural identity became increasingly important. 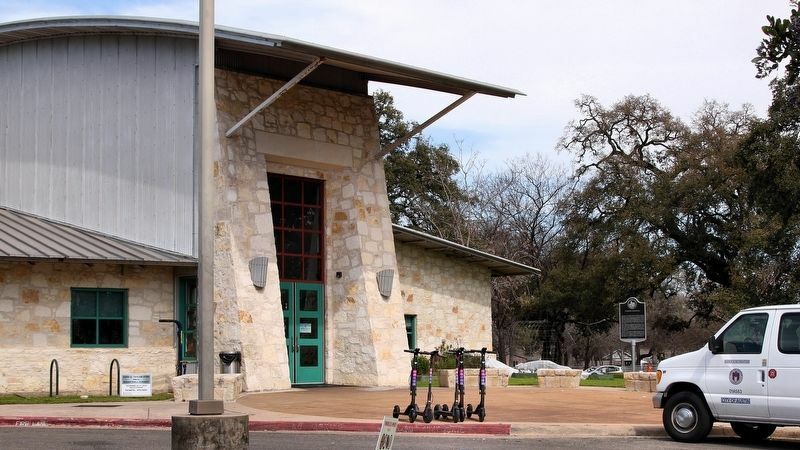 Recognizing the need for recreational space in which to celebrate their heritage, community leaders petitioned the City of Austin for a neighborhood park. In 1931, the city purchased land at this site for that purpose. 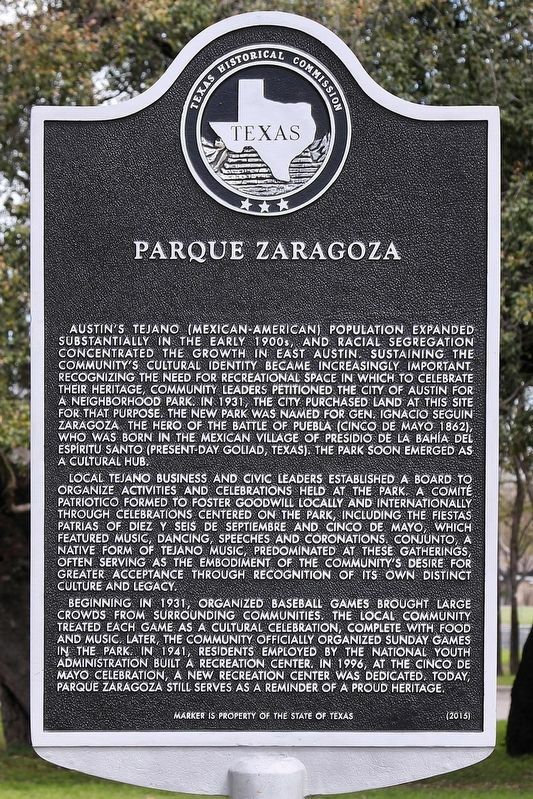 The new park was named for Gen. Ignacio Seguin Zaragoza, the hero of the Battle of Puebla (Cinco de Mayo 1862), who was born in the Mexican village of Presidio de la Bahía del Espíritu Santo (present-day Goliad, Texas). The park soon emerged as a cultural hub. serving as the embodiment of the community’s desire for greater acceptance through recognition of its own distinct culture and legacy. Beginning in 1931, organized baseball games brought large crowds from surrounding communities. The local community treated each game as a cultural celebration, complete with food and music. Later, the community officially organized Sunday games in the park. In 1941, residents employed by the national youth administration built a recreation center. In 1996, at the Cinco de Mayo celebration, a new recreation center was dedicated. Today, Parque Zaragoza still serves as a reminder of a proud heritage. Location. 30° 15.685′ N, 97° 42.68′ W. Marker is in Austin, Texas, in Travis County. Marker can be reached from the intersection of Gonzales Street and Calles Street, on the right when traveling west. Touch for map. Marker is at or near this postal address: 2608 Gonzales Street, Austin TX 78702, United States of America. Touch for directions. Other nearby markers. At least 8 other markers are within walking distance of this marker. Mount Olive Baptist Church (approx. 0.7 miles away); Tillotson College (approx. 0.7 miles away); Blackshear Elementary School (approx. ¾ mile away); Henry G. Madison Cabin (approx. ¾ mile away); Site of Old Anderson High School; Kealing Jr. High School (approx. 0.9 miles away); Military Order of the Purple Heart Monument (approx. 0.9 miles away); Gold Star Mothers of Texas Monument (approx. 0.9 miles away); Sailor from the Belle Shipwreck (approx. 0.9 miles away). Touch for a list and map of all markers in Austin. More. Search the internet for Parque Zaragoza. Credits. This page was last revised on March 7, 2019. This page originally submitted on March 6, 2019, by Larry D. Moore of Del Valle, Texas. This page has been viewed 44 times since then. Photos: 1, 2. submitted on March 6, 2019, by Larry D. Moore of Del Valle, Texas. • Bernard Fisher was the editor who published this page.